Economists teach that an inefficient tax is one that changes people’s behavior for the worse. Good policy encourages us to do things only when they make economic sense. Bad policy rewards us for doing things we’d never do otherwise if it weren’t for tax reasons–something economists call “economic distortion” from taxes. Usually we think of economic distortion in prosaic terms of dollars and cents. For example, a country might become poorer if taxes encourage us to work less, or we might buy wastefully lavish homes because we can deduct our mortgage interest from income taxes. But sometimes economic distortion from taxes crosses into moral territory. Sometimes, with sufficiently bad tax policy, we’re encouraged not just to do wasteful things but to do positively malevolent things to others, all for the purpose of tax savings. In this respect, there is no tax with more questionable moral consequences than estate and gift taxes, which sometimes force families to make complex life and death decisions while hundreds of thousand of dollars of tax liabilities hang in the balance. As we’ve noted before, the current federal estate tax is scheduled to disappear for year 2010, but will return on January 1, 2011 at 2001 rates and exemption levels. It’s easy to see the shocking economic incentives that creates regarding the timing of death. Under current law if a sick or elderly family member dies December 31, 2010 they pay zero estate tax. But if they live one additional day into 2011, they pay estate tax rates of up to 50 percent, resulting in potentially large tax liabilities. To most non-economists, this idea that estate taxes can affect moral decisions regarding death seems implausible. But there’s a mountain of data that illustrate it in practice. In one famous example, University of Michigan economist Joel Slemrod found changing estate tax laws clearly affect the timing of deaths, in exactly the way we’d predict. To be fair, Slemrod’s study argues some of the effect is due to doctors fraudulently changing dates on death certificates, rather than families pulling the plug on elderly and sick family members. 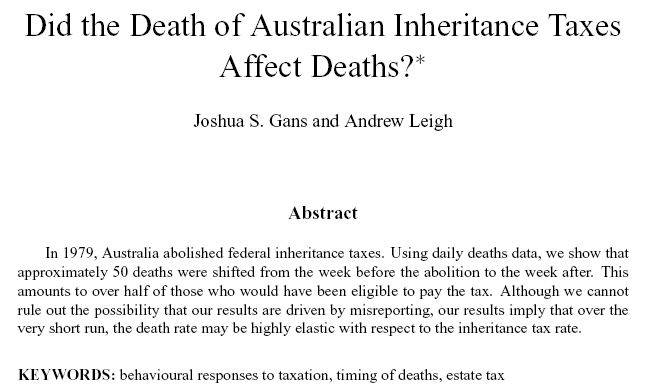 But for those looking for somewhat stronger evidence, a new study of death rates following the repeal of Australia’s estate tax in 1979 provides some eye-opening results from Down Under–highlighting the need to repair the flaws in our own estate tax before we fall off the 2011 precipice.